After the weak showing of 5 quarters, Korea’s display panel industry is distinctively showing trend of growth. According to Samsung Electronics and LG Display’s 1Q 2015 performance announcements, the total sales of Korean display of 1Q is approximately US$ 12,900,000,000. Compared to the previous quarter (QoQ) the sales showed a decrease of 9%, but compared to the same quarter of the previous year (YoY) it is a 20% increase. The worst quarter of the last 2 years, in terms of sales performance, was 4Q 2013. Generally, 4Q which includes Christmas season shows best performance but in 2013 the numbers actually fell compared to 3Q. However, 2014 showed the more general flow of continued sales increase every quarter. 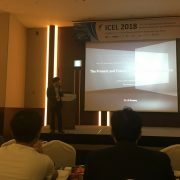 According to this quarterly performance, it is analyzed that 2015 Korean display panel will fit the growth pattern; YoY of this quarter and previous quarter shows 14% and 20% of growth respectively. The reason for Korean display industry’s recovery trend is LG Display’s continued positive performance. 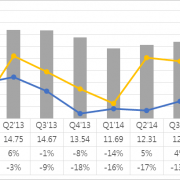 Comparing the market share in sales between Samsung Display and LG Display, LG Display is leading the market for the past 3 quarters occupying more than 50%. The elevation in LG Display’s performance is seen to be from Apple iPhone 6’s improved performance. However, as the iPhone 6’s shipment increases, it is likely that the rival Samsung Electronics’ Galaxy sales will fall, leading toward the possible slowdown of Samsung Display’s performance. Samsung Display and LG Display’s success will inevitably differ depending on the market share of world leading smart phone companies that they supply, Samsung Electronics and Apple. 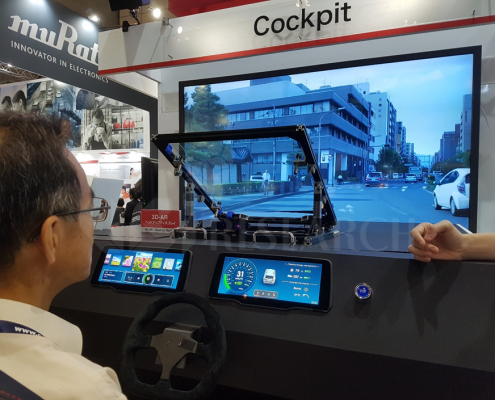 However, the Korean display industry, no matter which Korean company comes ahead, is expected to continue its growth. http://jpn.olednet.com/wp-content/uploads/2015/05/Analyst-Column-Green-Light-for-Korean-Display-Industry1.png 409 942 OLEDNET http://jpn.olednet.com/wp-content/uploads/2015/09/logo_oled.png OLEDNET2015-05-08 17:13:512015-05-08 17:13:51[Analyst Column] Green Light Lit for Korean Display Industry? OLED market is heating up again. Rigid OLED market growth was temporarily stalled but with Samsung Electronics and LG Electronics’ new flexible (plastic) OLED products, Galaxy S6 Edge and G Flex 2 respectively, the smart phone market’s temperature is rising. In order to maintain the storm that iPhone brought, Apple is preparing to release smart watch equipped with LG Display’s plastic OLED. Additionally, LG Elec. is targeting the premium TV market with their 55 inch and 65 inch UHD OLED TV. 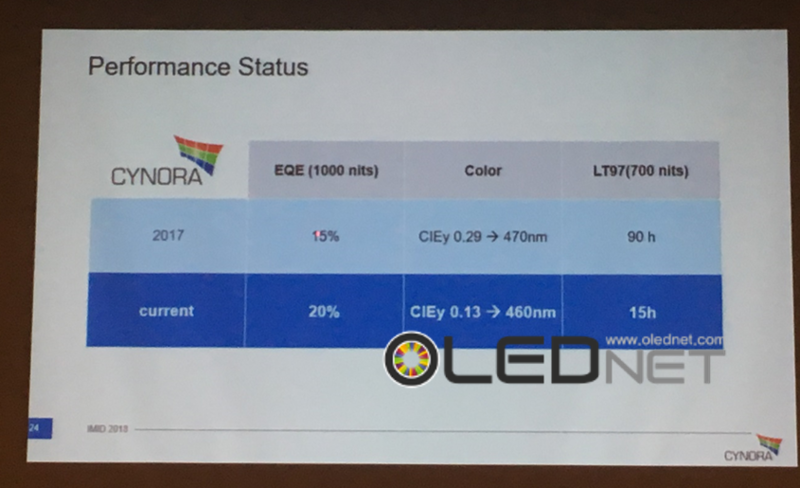 OLED panel leading company Samsung Display decided on Gen 6 line’s additional investment for flexible OLED production expansion. LG Display also decided on supplemental extension of Gen 4 line in Paju responding to the shortage of plastic OLED supply. 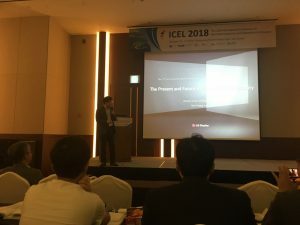 Furthermore, JDI is joining in and expected to begin Gen 6 flexible OLED line establishment soon. Recently announced Samsung Display’s decision to invest in large OLED line is the most encouraging news. Frontline leader in OLED display, Samsung Display mass produced 55 inch OLED panel using RGB OLED and LTPS TFT technology. 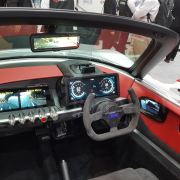 However, halting the production, Samsung Display explored for technology with better business value and recently selected to produce large OLED panel using WRGB OLED technology. OLED panel production technology can be largely separated into 3 parts: TFT, OLED, and encapsulation. Large OLED panel production technology is very difficult to obtain yield compared to small panel. Therefore, while the above 3 technologies are important in producing good panel, technology that can acquire good yield for mass production can guarantee business value. Particularly, as encapsulation is the last process, the final yield depends on the encapsulation method. Hybrid encapsulation technology can be further divided into film method and dam & fill method depending on the adhesive structure between top plate and passivation film. Film method is being applied to mass production by LG Display, and dam & fill method was developed led by Sony. This method dispenses adhesive polymer liquid after organic dam installation on the panel border. This can only be used when the top plate is glass. LG Display completes the process by sealing the metal plate laminated with adhesive film to the device. A best suited technology for curved TV and rollable TV production. The OLED panel for TV production technology decided by Samsung Display was initially known to select WRGB OLED structure similar to LG Display, but TFT and encapsulation technology have not yet been revealed. 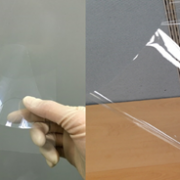 However, TFT technology is highly likely to be oxide TFT. 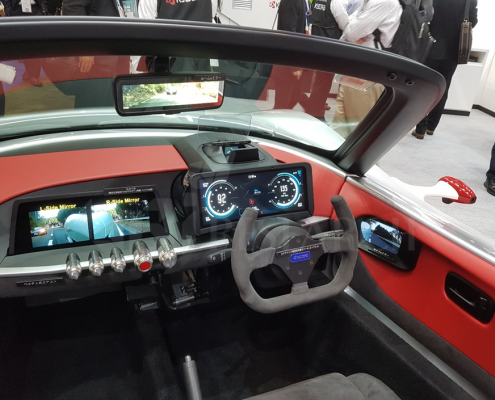 (Reference February 27 OLEDNET article) LTPS TFT has high investment cost compared to oxide TFT and has low business value at similar performance. What is left is encapsulation technology. For this technology also a method already commercialized by LG Display, film lamination method, is most suitable since metal plate is favorable for curved design. Metal plates is strong against external shocks and favorable for heat sink. Glass has lower heat conductivity compared to metal and requires additional protection against heat; this means that production cost can only increase. Considering design, protection against external shocks, and reduced heat sink cost, LG Display’s hybrid encapsulation technology that uses metal plate is the most ideal. Therefore, the direction that Samsung Display should also head toward is metal plate and film using method. 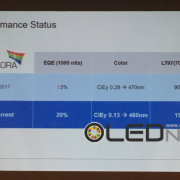 Although small OLED for mobile technology developed by Samsung Display became the norm, it is estimated that LG Display’s technology will become standard for large OLED panel production. 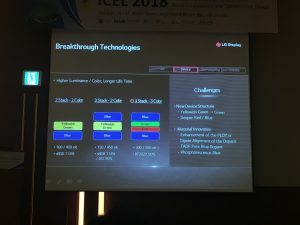 http://jpn.olednet.com/wp-content/uploads/2015/03/인캡사진.jpg 446 1305 OLEDNET http://jpn.olednet.com/wp-content/uploads/2015/09/logo_oled.png OLEDNET2015-03-30 17:43:492015-03-31 10:49:54[Analyst Column] Encapsulation Technology, Where is it Going?